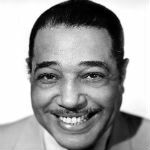 Duke Ellington (April 29, 1899 – May 24, 1974) was an American composer, pianist, and bandleader of a jazz orchestra, which he led from 1923 until his death in a career spanning over fifty years. Born in Washington, D.C., Ellington was based in New York City from the mid-1920s onward, and gained a national profile through his orchestra’s appearances at the Cotton Club in Harlem. In the 1930s, his orchestra toured in Europe. Some of the musicians who were members of Ellington’s orchestra, such as saxophonist Johnny Hodges, are considered to be among the best players in jazz. Ellington melded them into the best-known orchestral unit in the history of jazz. Often collaborating with others, Ellington wrote more than one thousand compositions; his extensive body of work is the largest recorded personal jazz legacy, with many of his works having become standards. After 1941, Ellington collaborated with composer-arranger-pianist Billy Strayhorn, whom he called his writing and arranging companion. Ellington recorded for most American record companies of his era, performed in several films, scoring several, and composed stage musicals. Due to his inventive use of the orchestra, or big band, and thanks to his eloquence and charisma, Ellington is generally considered to have elevated the perception of jazz to an art form on a par with other more traditional musical genres. His reputation continued to rise after he died, and he was awarded a special Pulitzer Prize for music in 1999.